An inexpensive handheld sensor may simplify testing for pesticides on fruits and vegetables – but won’t replace government monitoring. (Inside Science) — Pesticides are an important part of modern farming. But the very word now sounds sinister to many people’s ears, thanks to controversy over their use and safety. The U.S. federal government has mechanisms intended to protect people from dangerous pesticide exposure. The U.S. Environmental Protection Agency sets the allowable residue levels, called tolerances, in foods, and the Food and Drug Administration tests selected products annually, as does the U.S. Department of Agriculture. When violations for excessive pesticide residues or unregistered chemicals are found, the FDA is the enforcer. But the government’s monitoring practices have come under fire for their incompleteness and lack of statistical validity, and many environmental activists take issue with assurances of pesticides’ safety. What if a shopper could whip out a handheld device to measure the identity and quantity of pesticides on her produce? Just such a device is being developed by Shalini Prasad, a professor of bioengineering at the University of Texas at Dallas. Prasad wants to disrupt the current system for monitoring pesticide residues by empowering growers, organic food certifiers, grocers and consumers to check for themselves. To test for pesticides, users simply pass a swab over the fruit or vegetable, insert the swab into the detector and wait about 30 seconds. A green light on the face of the device means the pesticide residue is under the EPA tolerance; a red light means the opposite. The detector requires one swab per chemical and can identify up to 24 chemicals. That ought to be enough to cover the most widespread and problematic pesticides, said Jennifer Sass, a senior scientist at the Natural Resources Defense Council. In a 2012 study published in Biosensors and Bioelectronics, Prasad established the device’s workability using atrazine, the most common herbicide detected in drinking and groundwater, which is used as a weedkiller but has also been found to disrupt amphibian sexual development. She expects that her $20 device could hit the market about 18 months after she secures startup funding. Prasad’s device is one of many new sensor technologies. Portable sensors are “easy to use, fast, potentially low cost, and very sensitive. You don’t have to be a specialist to do the analysis,” said Omowunmi Sadik, director of the Center for Research in Advanced Sensing Technologies and Environmental Sustainability at SUNY Binghamton, who is not involved with Prasad’s sensor. But others are more skeptical. Ray McAllister, Senior Director for Regulatory Policy at CropLife America, a pesticide industry trade group, doubts that any device based on swabbing the outside of a fruit could really work. “If you take a swab, you’re only looking at a small part of the fruit or vegetable,” he said. “You might miss the residue entirely.” When produce is sampled for regulatory testing in a certified analytical laboratory, multiple pieces of the same fruit or vegetable are ground up together, he said. McAllister doubts the effectiveness of Prasad’s sensor because “if there were residue in the interior you wouldn’t find it.” Additionally, if the test found nothing, he said, you couldn’t be sure that the entire surface was safe. Prasad stressed that her sensor is not intended to replace certified lab tests, but said it is far more sensitive — its nanoporous aluminum oxide membrane can accurately measure single pesticide molecules on individual food products rather than the larger batches necessary for lab analyses. So the cost to test a single fruit or vegetable is on the order of pennies, which adds to the value of the device as a quick, portable and affordable field test. When a pesticide is first registered or the manufacturer wants to apply it to a new crop, the manufacturer tells the EPA how much is left on the commodity when the pesticide is used according to directions. The agency uses these data to set a “tolerance” — the maximum residue allowed — specifically for each crop the pesticide will be used on. Separately, the EPA estimates a reference dose — the maximum amount considered safe if consumed daily for 70 years — based on toxicity data from animal tests, also provided by the manufacturer. The two levels are combined with an added “safety factor” (which lowers the allowance by one or two orders of magnitude to err on the side of caution) to arrive at an estimate of the total allowable exposure from all sources that would protect public health. Generally, the FDA finds that most U.S. produce contains residues below the EPA tolerances. Violations are detected much more frequently on imported foods. The FDA’s monitoring program focuses most on products, countries, or producers that have had past violations and on the most commonly consumed foods. If the EPA’s risk analysis is accurate and the FDA and USDA sampling systems provide a true picture of how much pesticide residue is on domestic and imported produce, consumers should be safe. But critics challenge both these assumptions. Many researchers say standard toxicology tests may not identify all of a chemical’s hazards. “These studies typically examine very high doses, and look for overt signs of toxicity — like severe loss of body weight or death. Yet academic studies have demonstrated that low doses can induce adverse effects as well,” said Laura Vandenberg, a developmental biologist at the University of Massachusetts Amherst School of Public Health and Health Sciences. Thus established tolerances may not be fully protective. A 2014 General Accountability Office report found serious flaws in the FDA’s monitoring methods. Because the agency targets specific commodities that have shown past violation and does not randomly sample from the entire spectrum of agricultural products, the GAO said, “FDA cannot reliably evaluate the extent to which its monitoring program detects and intercepts violations at a rate greater than random chance.” In addition, the report stated that the FDA does not test for violations of the established tolerances for several common pesticides. For example, nearly 300 million pounds of glyphosate, the world’s most widely-used herbicide and the active ingredient in Roundup, are applied annually to U.S. farms. This is almost 300 times the amount applied in 1974, the year it was first registered, and the EPA has raised allowable glyphosate residues several times. Yet until 2017 the FDA did not monitor glyphosate because it was not detectable using the standard multi-chemical testing protocol. Once the agency developed a test specifically for the herbicide, it analyzed glyphosate residues in soybeans, corn, milk and eggs. Preliminary results showed no residue violations in these foods. The FDA plans to add other foods in 2018. Glyphosate’s status as a carcinogen is hotly disputed, with the International Agency for Research on Cancer ruling that it “probably” is and the EPA deciding it isn’t. Prasad’s sensor could potentially serve a variety of testing or screening roles. Growers could use the device to check for the unintended spread of pesticides beyond the targeted fields, and the device might be used to monitor farmworker exposures, said Carl Winter, professor of food science and technology at the University of California at Davis, who is not involved in the project. Prasad’s sensor could also be useful for organic certifying organizations, which are licensed by the USDA to test foods and other products claimed to be organic. Connie Karr, certification director at Oregon Tilth, a USDA-accredited non-profit, said that Prasad’s pesticide sensor “sounds really promising.” Although it would not replace tests by analytical laboratories, results from the handheld sensor could help the inspector decide if further followup was needed, she added. 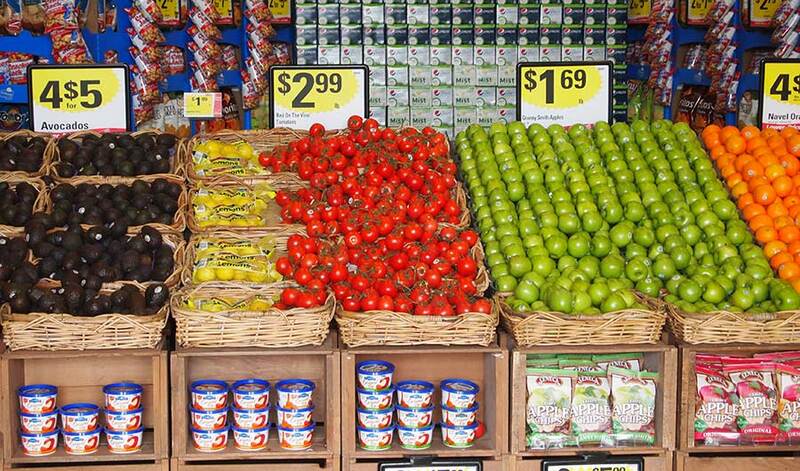 Consumers might also want to use the sensor to test produce themselves in the store. Annie Fulkerson, former owner of the Oasis Fine Food Marketplace in Eugene, Oregon, said there is a potential for “chaos” if the device were inaccurate and shoppers accused the store of misleading them. But if accurate, the device could lead to a productive conversation between grocers and their customers, Fulkerson added. She thought a better use would be for wholesalers and others up the supply chain to use the device to monitor products as they come through. McAllister worries that false positives could scare consumers, and false negatives could make them complacent. Winter, meanwhile, considers the federal monitoring system to be trustworthy, and fears that consumers using the device might be frightened unnecessarily. “I don’t see a big health benefit to consumers for something like this, and I see the potential [for something like this] to exploit consumers,” he said. But in a world where portable devices and medical wearables give individuals the opportunity and burden to manage their own health, this argument may not always be persuasive. Miriam Rotkin-Ellman, a senior scientist at the Natural Resources Defense Council, observed that the residue levels considered safe by regulatory agencies continue to change as we gain a better understanding of how pesticides affect sensitive populations like developing fetuses. The average person, she said, might want to avoid products with residues altogether. Prasad hopes her sensor might give such people the chance to take control of their own risk.